The Carboy Cleaner makes cleaning carboys, including PET carboys, a breeze. Attach to a cordless drill, insert into your carboy, move up and down and let the Carboy Cleaner do the rest! 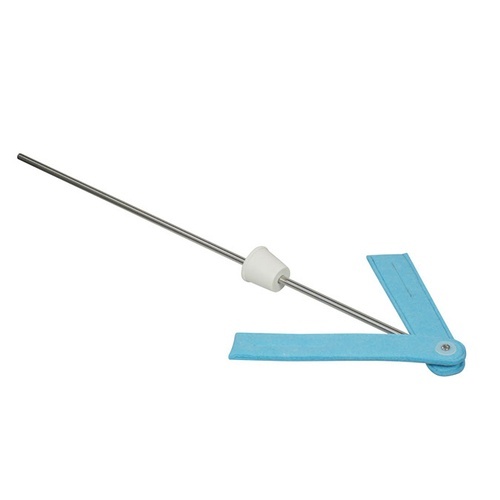 Constructed of a stainless steel rod with two super absorbent, lint free, soft cleaning pads this product is designed to attach to a drill for high rpm use. High-strength, yet flexible plastic inserts inside the pads help keep the pads rigid during use. The expanding sponge at the end of the cleaning pad assists in the centrifugal cleaning force for tough to get debris. Works with any size carboy between 3 and 6 gallons. Works equally well with glass and PET Carboys. Comes with small size bung for glass carboys. Medium size bung for PET carboys can be purchased separately (FE470). Also works great for 5 gallon kegs! Effectively cleans carboys up to 32 cm / 12.6 inches in diameter. I said to myself, "Heavens to Betsy! Now that's a super-dee-duper humdinger of a deal!" Many of my car boys have some residual in them after soaking and cleaning. So I thought this might be a quick way to remove those residuals. The problem is physics. The cleaner is made from weighted strips of felt-like material. When the shaft is spun, the strips bend, collapsing toward the shaft, so contact with the sides of the carboy isn't good. It's also difficult with a new one, to get the strips inside the carboy. As a result, I don't use mine very often. But you may have better results. does a good job,lay the carboy on its side. What a timesaver! Iused to struggle getting carboys and kegs cleaned. now in a matter of a minute or two it’s done. This is one of the best values I’ve seen. Works much better than the old brush. Felt like it got the film off of the sides, and got it nice and clean. It is a bit of a challenge to get it into the cleaner, but once in, it does the job well. A great way to do a hateful task. Makes the car it sparkle and saves water and time. Carboy cleaner works awesome!!! So much better than a carboy brush!!! Just use the low setting on your cordless drill. The main problem with the tool is that it is hard to get in an out of the carboy at first. And, it needs to be broken in (say, use 3 times). Like the large scrubbers in an automatic car wash, they need to soften up a bit and then it works great. Don't be shy on using elbow grease with the drill. The neck of some carboys are too narrow to fit the cleaner through and the screw/nut is not adjustable to make it slightly shorter. Getting it in & out of the carboy is really hard at first, but after I crunched the cleaning pads really hard with a pliers, it's much easier. The cork that comes with it to minimize vibration is useless - much better to use a rag or a sponge. Laying the carboy on it's side is the trick, works much better that way, just be sure to use a towel or a doorstop to keep the carboy from rolling off the counter. By moving the drill up and down, and changing direction, I was able to get all the way up into the shoulders and clean the carboy. If the manufacturer could shorten the screw, soften the structure in the brushes but perhaps make the fabric more aggressive, and provide a better cork/closure, this product would be great. This tool puts the finishing touch on cleaning the carboy. I brush the carboy first to get the heavy deposits off. The problems I see with the tool is that it is hard to get in an out of the carboy. My biggest concern is that if I can not get both of cleaning pads to be symmetrically opposite one another, it sets up a vibration problem and I am afraid it could damage the glass carboy. Kicks all the gunk loose if used soon after siphoning. A definite step up from the normal carboy brush. I tested this out on an old better bottle before using it on my new units. I hit it pretty aggressively and checked for scratches after it dried. Worked great, is going to save a ton of time and water not having to soak the better bottles full of cleaner to get the krausen that stuck on. This product works very well. The two arms don't always extend opposite of each other. You can tell by the amount of wobbling. You may have to stop and start several times to get them to fly right. It is difficult to get to the crud at the top of the carboy. It can be done if you operate at a much slower speed. A quick swipe with a carboy brush prior to cleaner solves that problem. I bought this with high hopes of never using "THE BRUSH" again. It didn't touch the crusted part above the water line PBW didn't help even with 15 minute wait. I keep it till the next dirty carboy and same thing. PBW a plug a soak overnight and the stuff falls off so what good is this cleaner? Also had problems getting the ends to go to opposite sides but that was a small issue that anyone would deal with if it actually cleaned the hard part of the job. Back to brush to get the big crud out and soak overnight! Zero star rating, it forced me to click a star or refused submission, sorry good guys get a marginal product. I was expecting this to completely clean carboys especially the layer of crud where the yeast floats during fermentation. Well it's a lot of fun to hook up to your drill and make a lot of suds but at the end of the day you'll still need to either let your carboy soak in PBW to eat away at the crud of use a carboy brush. Better yet get a wide mouth carboy so you can stick your hand in and make cleaning easier. Save your money and buy more hops. For any hobby, you want to minimize unwanted aspects of your recreation. My carboys may sit for months at a time in use or on the shelf waiting for the next batch to start. There may be other products on the market to choose from but this one greatly reduces the time spent cleaning. Clean and sanitize your carboy before you put it away and give it a once over and sanitize before you start  it will look like new. I expect it to work well cleaning the lower two thirds of my homebrew kegs you can?t reach by hand. I haven?t used it much but recommend ordering replacement pads after you are satisfied with the product. The previous time I brewed I only had time to rinse my carboy so the debris that did not come out hardened in place. It sat way too long, I saw this was new so I thought I'd try it. My drill had a low battery so I couldn't use 100% of it's power, but this Carboy Cleaner worked perfectly. My carboy looks like new after cleaning it with this product. My only issue is the sponges are just a little too wide, making it difficult to pull it out of carboy one it's soaked. Other than that, this thing is perfect.